Mersey Maritime, the representative body for the maritime sector in the North West of England, held its annual awards (MMIAs) on Thursday March 9 at a black tie gala dinner in the new stand of Liverpool Football Club. The gala was attended by 400 people with Louise Minchin from BBC Breakfast hosting the event. The organisation represents the interests of a maritime cluster of more than 1,250 businesses. The Awards recognise the excellence and diversity that exists across all sectors of the maritime industry in the North West. There were 12 winners on the night in categories ranging from Best Newcomer to Business of the Year Award. 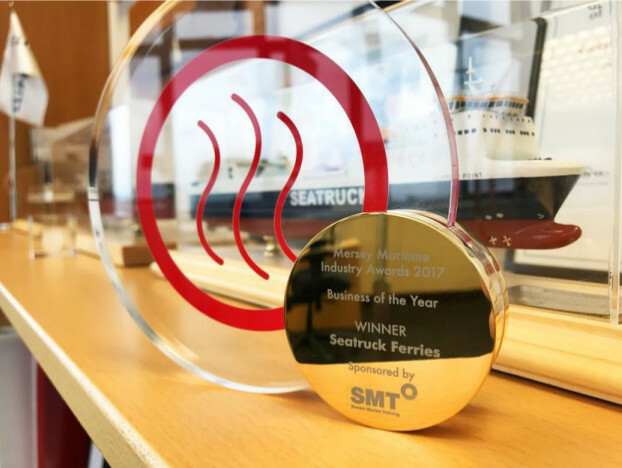 "This is another great accolade for Seatruck Ferries, who are now the most frequent commercial shipping service on the Mersey. Our Liverpool Dublin service was the fastest growing service on the entire Irish Sea in 2016. Well done each and every one of you."